Routine business processes like checking inventory, updating customer records, or generating reports are tedious but important. You have to type the same text carefully, and press the same buttons again and again. With Macro Recorder automation software you can turn these steps into a macro and have the program do the job for you. This will save you time and tedium whilst eliminating errors. The web browser is the most frequently used software today. More and more businesses and applications are moving to using web based systems. Macro Expert provides the features to automate the tasks when using a web browser such as filling out forms, checking new posts, submitting the requested information and printing reports. It greatly enhances your productivity when using the web browser. Macro Expert provides the actions to read data from multiple sources, such as Excel documents, databases, web pages, and even application windows. You can build a macro in minutes to read the data and enter them into specified applications or web pages. Automated data entry saves you time, eliminates tedium while eliminating errors. Web data extraction is crucial to most businesses. Contemporary business requires relevant data for appropriate, effective and reliable decisions. With Macro Program software , you can monitor in real time hundreds or thousands of news sources, blogs and websites to see what people are saying about specific products or topics. The gathered data can then be automatically stored to an excel document or database. Software testing plays an important role in the development of a wide range of applications. Macro Expert is a full featured automation software package that provides many ways to interact with applications. A tester can use the Script Editor or Recorder to set up complex test scenarios in minutes with no-programing required. Macro Expert provides 260+ actions and covers most of the possible automated tasks needs. Most actions of Macro Expert can be divided into the following groups: Interactivity (Mouse and keyboard), Webpage, FTP, Internet, File, Email, Excel Document, Database, Flow, Loop, System, Text, Window, etc. Simple and natural way to build macros with no programming required! Macro Script Editor is a powerful tool for editing the macro script. You just drag-and-drop appropriate actions to develop your automation application, never writing a single line of code even if creating a complex macro. In Script Editor, all actions of the macro will be presented in the manner that clearly describes what they do. This greatly reduces learning and development cost. 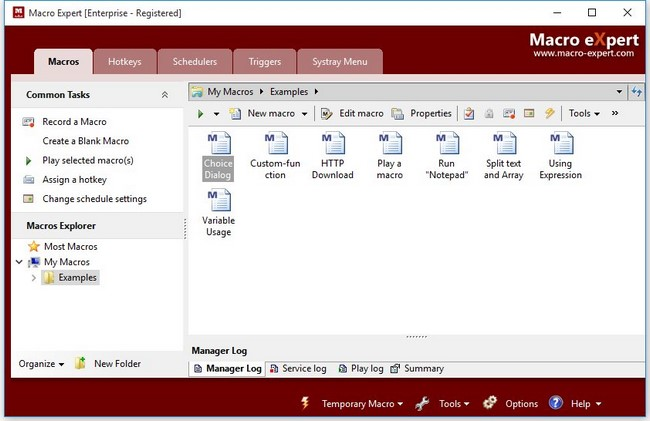 Macro Expert is a collection of several separate applications, Macro Manager, Macro Script Editor, Macro Player and Macro Service. Macro Manager is a tool for administering the macro list, such as creating a new macro, importing an existing macro, removing a macro from the list, setting the global options or changing the property of a macro and much more. You can create a macro by recording mouse and keyboard activities. The macro recorder will inspect the window state during the progress of recording to ensure the new macro’s flexibility – i.e. it performs correctly even if the destination window position or size is changed later. When a macro didn’t go according to plan, you need to determine what exactly causes the macro to fail. The Script Editor provides the debugging features to allow you to observe and test the whole or parts of the macro and to easily correct errors in a macro. The scheduler is an easy and convenient way to automatically launch a macro. It can schedule a macro to perform the tasks at a specific time. You can also schedule the macro to launch periodically (daily, weekly or monthly). Every managed macro can have up to 16 schedule items. The triggers give the macro an ability to automatically launch in response to certain events. For example, when a user logs into the desktop, a specified window opens, closes, is focused, a specified file is created or modified. A managed macro can have up to 16 triggers associated with it. Temporary Macro records the activities that are used only for a short time and then discarded. It will be overwritten each time you record new one. Each macro can be protected by a password. This helps to prevent unauthorized access to your macro in a multi-user environment. The password can even be promted before launching the macro. Macro Expert has an ability to automatically logon or unlock a workstation for playing a macro. It’s useful when a macro should be executed but there is no user logged into the desktop or the workstation is locked. 1. Added built-in function "REGEXP_FIND" to search for a regular expression match on a string. 2. Added built-in function "REGEXP_INDEXOF" to return the zero-based index of the first occurrence of the specified pattern in a string. 3. Added built-in function "REGEXP_REPLACE" to uses a regular expression to perform substitution on a string.